As a triathlete I am always looking to move faster on my feet, trying to get ahead of the person in front, and the best way to do that in a triathlon is in the running leg. The best triathletes are almost always the best runners. Not being born a natural runner, it’s important for me (165cm tall with short legs and over 6 years of weight training) to make the most of any edge I can get. As I stepped up my training from 6 hours to 15 hours per week (including interval and speed work) this load started to take a toll on my body. The first thing that played up was an old right foot Achilles tendinopathy injury. This is when I first discovered minimalist shoes (see our blog on minimalist/barefoot running for more information). Minimalist shoes have a low heel-to-toe ratio on the cushion/sole of the running shoe. While a standard running shoe has a 12:1 (heel-to-toe ratio), a minimalist shoe can have anywhere from a 5:1 to 1:1 ratio (Altra shoes). You can visit RunningFit for the best range of running shoes in Melbourne including a wide range of minimalist running shoes. 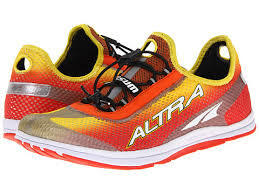 I moved straight into the Altra’s with a zero drop but my body was not ready for the increase in elongation of the Achilles tendon during the running stride. This flared up the injury and I had to stop running again for another 4 weeks. So there I was with a dilemma – normal shoes stop me running and zero drops also stop me in my tracks. My triathlon race season was not looking good – thankfully my swimming and riding was improving. The only reason that I was able to continue training at all was due to a range of treatments from the Osteopaths, Massage therapists, Exercise Rehabilitation Consultants and Myotherapists at Melbourne Osteopathy Sports Injury Centre. Being an Osteopath and a Triathlete I knew this issue was being caused by other factors that needed to be addressed, so I looked down and found the answer staring right back up at me. This is when I first met Mark Shine from RunningFit. I visited the store, which is well laid out, looks extremely professional and has a a really huge range of running shoes. Mark and I sat down and went through a complete history of my problems, discussed my current training programs and what my future goals were. This allowed Mark to understand who I was as an individual, what my expectations were and which running shoe would best suit me – being an Osteopath I know the importance of a thorough client history. Mark then placed me on a treadmill set up with some state of the art video analysis and started recording my running form. We started off with my old shoes and noticed on review how my right foot would flatten (pronate) too early thus causing my achilles tendon to flex into a C-shaped bend instead of acting like a nice spring. The C-shaped torsion was putting excessive stress on this tendon and thus causing my problem. Mark decided to try 3 different types of shoes – ASICS GEL-DS Trainer, SAUCONY Mirage 2 and MIZUNO Wave. All three shoes had either a 4:1 or 5:1 heel-to-toe ratio. With each shoe we then repeated the video analysis and noticed that as the amount of medial arch support in the shoe increased, the amount of stress (C-shape) on the Achilles decreased. The best running shoe for me ended up being the SAUCONY Mirage 2 which has a 4:1 ratio and slightly stronger medial support. For me, this shoe ended up providing me with the best of both worlds – a minimalist shoe with some support and control for my flat feet. When I started running again I was pain free in the Achilles which gave me a huge boost for the rest of my race season. I’ve now been running in these shoes for 8 months with no pain and the shoes are still in good condition. The message here seems pretty clear – make sure you visit a professional shoe store like RunningFit if you are having issues with your running shoes. There is a simple rule that I follow which is “If it’s not broken don’t fix it” but if something is broken then it’s important to seek help as quickly as possible to prevent other injuries flaring up. Additionally, it is always best to get checked out by an Osteopath or Exercise Rehabilitation Consultant to investigate the primary causes of your injuries. If you would like any further information please call Melbourne Osteopathy Sports Injury Centre on (03) 9939 1289 or email us at info@melbourneosteopathycentre.com.au. Stay tuned for more blogs from ‘Dr Osteopathy – The Amateur Triathlete’ on I how to prevent injuries when training.